In response to my post yesterday on how I organize my notes in Evernote, a number of people asked for more concrete examples. They wanted to see what my notebook structure and tags actually looked like. So today I present you with an annotated look at my actual notebook and tag structure for Evernote. Here are all my notebooks in Evernote, and the stacks in which they are included. The red numbers are keyed to the annotations below. The “Meals” notebook in my Diary stack is where notes go on those rare occasions when I use Evernote Food. I keep telling myself I am going to use it more often, and then I forget. This is why there are only 3 notes in that particular notebook. My “Freelance Writing” notebook stack is the least organized of all of my notebook stacks. I think I could probably do with far fewer than 10 notebooks here. My short term problem is that the amount and variety of freelance work I’ve been doing has been increasing and I’ve been looking for ways to partition the different types of work from one another. I suspect this list will be consolidated in the months to come. My “Digital House” notebook is where I keep floor plans of my house, with measurements, as well as annotated photographs of certain areas. I use this when I’m a the hardware store and need to recall the size of a doorway or the height of a bookshelf in my house. My “Filing Cabinet” notebook is where the bulk of my documents go. Bills, statements, nearly everything that I scan. It all goes into my filing cabinet. “Jamie’s Notebook” is a holdover from when I first started using Evernote and had only one notebook. I almost never use this notebook anymore, but haven’t taken the time to refile the 7 notes that still remain in that notebook. My “Inbox” notebook is my default notebook. When I scan things in, this is where they go by default. If I have an automated process that pulls notes into Evernote and doesn’t specify a notebook, this is where they end up. I try to review my Inbox about once a day, at the same time I run through my process for scanning in paper, and get it emptied. You can see that I’m about 2 or 3 days behind on this task. My “Clippings” notebook in my Reference stack contains anything that I clip from the web or email. When I clip these things using the Evernote Web Clipper or Clearly, they go into this notebook by default with a tag of “to-read”. I have a saved search that shows me everything marked “to-read.” Once I’ve read the clipping, I remove the tag, but the clipping typically stays in the notebook unless I’m certain I’ll never need it again. My “HOWTO” notebook contains two different types of note: (1) scanned in instruction manuals for every device I own, for every toy my kids have, etc. (2) My own instructions for how I’ve configured things, for example, how to install and configure Geeknote on my iMac. My “Shared” notebook stack contains any notebook that I publicly share, like my Going Paperless notebook. My “Special Projects” notebook stack contains notebooks dedicated to special projects that I am working on. I only create these when I know there will be a lot of documents associated with the project. My “Work” notebook stack contains notebooks related to my day job. In all of these cases (with the obvious exception of my Freelance Writing stack) I try to keep notebooks to a minimum. These represent the “partitions” of information and allows me to either focus only on one subject, by looking at a specific notebook, or narrow the scope of my searches in Evernote by limited them to a notebook. There was some question about the difference between lists and groupings. Here is how I think about it: a list tends to collect notes in a single notebook and slice and dice them in different ways. My reading list is a good example of these. All of the “notes” for my reading list are in my Timeline notebook. They are all tagged “reading.” Some of them are also tagged “novels.” So I can look at everything I’ve read, or I can look at just the novels I’ve read. Grouping associated notes together regardless of the notebook in which they are filed. So I have a lot of notes tagged either “taxes” or “receipts” in my “Filing Cabinet” notebook. But I also have a quite a few notes tagged “taxes” or “receipts” in my “Businesss” notebook in my Freelance Writing stack. If I want to see everything I have related to taxes, regardless of the notebook (partition) in which it falls, I can search by the taxes tag. Some tags have only 1 note. These are typically tags that I no longer use and just haven’t cleaned up. But in other cases, even when the tag has 0 notes, it may be because I plan on using it in the future. In some instances, I have set up “sub-tags” to help reduce clutter and better organize things. My “reading” tag and its sub-tags are a good example of this. It is important to note that I only use tags when I think they will be useful–as when they fall into one of the three conditions above. Out of more than 5,500 notes, nearly 20% of them (949) have no tags at all. I am perfectly fine with this because I can still find them within a few seconds. I hope these annotations help better explain how I organize my notes. I am happy to answer any questions in the comments. Jamie, thank you so much for sharing this additional level of detail. This has given me some good ideas about some ambiguous tags and notebooks that I should probably consolidate to simplify my setup. The quick response on this is GREATLY appreciated! Thanks Jamie. I particularly lake your take on tags, lists vs groups. I have a hard time with untagged notes, personally. I feel that if there is nowhere that they belong, why have them? That and if I forget to tag a note, I will find it when I review “Untagged Notes” from time to time. That’s the beauty of evernote though, the choice. I believe it’s Christopher Mayo who uses no tags at all for his notes. Jamie, thank you for all the great posts you’ve put out there on how you use Evernote. They’ve been really helpful to me in figuring out my own system. You’ve made some comments across your posts about how you use the metadata fields to your advantage. I was wondering if you could provide your thoughts on that as well. I, too, do things like change the creation date to the date of the event or document, but it sounds like you do a bunch of other things too. Do you change the “Author” to the author of the book your reading and such? Very interesting write up. I always find these kind of posts very informative and always pick one or two tips. I personally try to keep everything in just a handful of notebooks, not use tags and rely on search to find the information. So far it has been good but from time to time I’m considering introducing more notebooks to split in more coherent way. Thanks for sharing all the Evernote tips. Thanks all your posts have been very helpful. I have been interested in Evernote for some time now but organizing it seemed overwhelming. I really like that you keep it simple. I am wondering how you are able to send your magazines to Evernote though. I can’t seem to figure out how to do it. 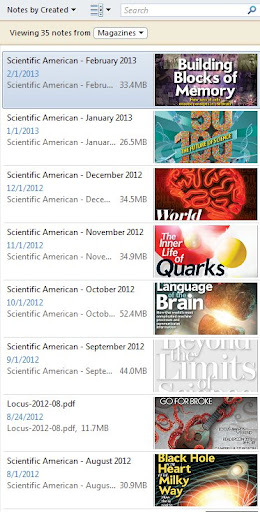 Jill, the magazines that I send to Evernote are only those that I receive in PDF format. When I get them, I simply right-click on them in Chrome, and choose the Clip PDF to Evernote option (this is available when you are using the Evernote Web Clipper for Google Chrome). How do you move a subtag back to a main tag? I accidently did a subtag but can’t how to make it a main tag. Thanks for great posts on Evernote. I’m learning and growing with it. Trying to go paperless – too many file cabinets of paper as well as traditional books.